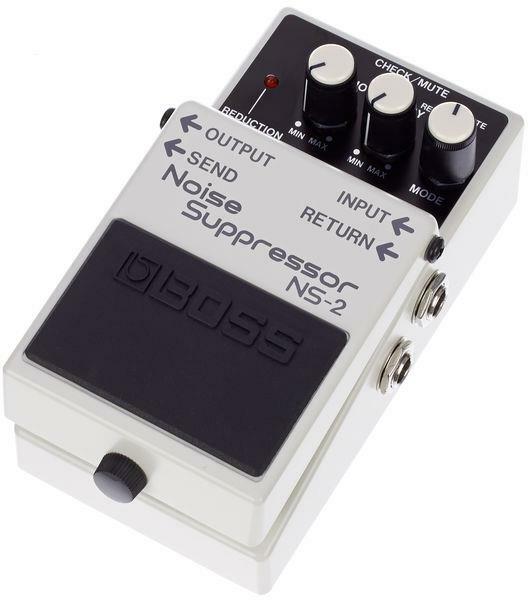 The Boss NS-2 Noise Suppressor is the perfect pedal if you’re looking to quieten down a noisy set-up. If you're tired of annoying noise and hum, the NS-2 is the answer and features Boss' unique noise detection circuit. And Boss’s proprietary technology means the NS-2 works perfectly without affecting your core guitar tone. Best of all, it’s designed to be a super flexible pedal with a load of different modes and ways to use it. With it’s input/output and send/return jacks it’s basically a Swiss army knife noise gate. You can run it directly in-line with just the input/output jacks, or put different effects in the NS-2’s loop, so the noise from these pedals is tamed separately. Plus, it’s a Boss, and if there’s one point in your signal chain that you need reliability, it’s the point that’s meant to keep everything else in check. The NS-2 has been used by countless pros, all over the world, since its original release way back in 1987, and just keeps consistently getting the job done, perfectly. Q1: What’s the 4 cable/x-cable method or mode, and should I use it? A: The four cable mod is a way that some players have found to make the most out of the NS-2 and is basically a way of putting your amp’s preamp in the NS-2’s loop. To give it a go just plug your guitar into the NS-2 as normal then run out of the NS-2’s send jack into your amp’s input, your amp’s FX send then runs into the NS-2 return jack and the NS-2 output then goes into your amp’s FX return. This way you get noise reduction on the input, plus post-preamp gain stage noise reduction too. Your mileage with this set-up may vary, and whether it works for you or not depends on your exact set-up. With some amps and pedals it works perfectly, but with others may create ground loop and impedance issues. It’s great for heavy and high-gain playing and is definitely worth a go if you’ve got a noise problem that’s coming from both your preamp and pedals. Q2: Why does the NS-2 have two power sockets? A: One of the power sockets is a power input, and the other is an output. To add to the NS-2’s flexibility Boss have added this output so you can power other effects via a PCS-20A cable. Just plug a regular 9v power supply into the power in jack and hook-up power to your other effects with the power output and PCS-20A. The NS-2 will source up to 200mA of current, so enough to power a small pedal board of up to 5 pedals or so. The Boss TU-3 also has this power output feature and if you have a larger board with both an NS-2 and TU-3, you may be able to power your whole board from just these two Boss pedals. Even if you decide to use a separate power supply, these Boss power outputs can be absolute gig savers, should your PSU fail you at the wrong moment. Q3: What’s the difference between the reduction and mute modes? In short, mute completely cuts the signal when the input falls below your preset threshold, whereas reduction just cuts the noise down. Most players say reduction sounds more natural, but if you’re looking for solid, staccato metal chugging for your rhythm playing, you’ll probably prefer the aggressive nature of the NS-2’s mute mode. The earlier Boss noise suppressor - the NF-2 - didn’t have this more advanced reduction mode. Q4: Is the NS-2 Made in Japan (MIJ)? A: No. 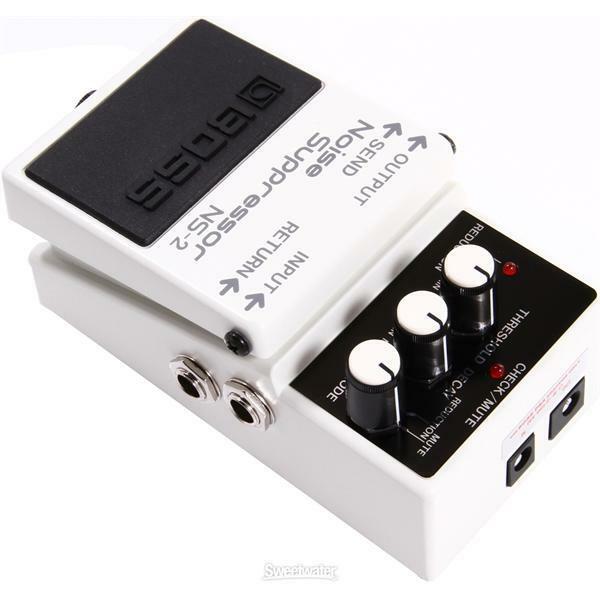 Although Japanese made Boss pedals are much lusted after, the NS-2 is currently made in Taiwan. For it’s first couple of years of production (’87-’89) the NS-2 was MIJ, so there are some floating around online. 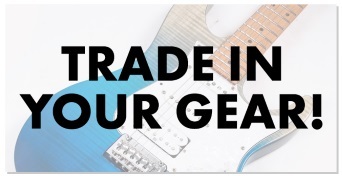 However the current range of Boss pedals retains the quality of the earlier Japanese Production, but at much more competitive pricing than Japanese production would allow. 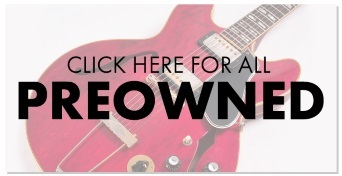 As long as the pedal's registered after purchase Boss provide a full five-year warranty for all compact pedals and Boss pedals are generally regarded as the most reliable pedals available.